Despite the fact that municipal workers are putting in long days to make life better for everyone, it often feels like they’re at odds with the public. Most municipalities have at least thought about customer education and outreach in an effort to combat misinformation and unfair stigmas about the sewer and water industry. While a general outreach effort is great, sometimes achieving a certain goal or promoting a particular project takes a more focused approach. Take Tallahassee’s Stormwater Management Group, which won an award for its campaign to reduce stormwater pollution. The city found its most cost-effective method of treating stormwater pollution is to stop the flow before it enters waterways. Their award-winning Think About Personal Pollution campaign demonstrated that load reductions from education efforts saved $450,000 annually versus spending an additional $2.5 million per year on traditional best management practices. To that end, Cahoon visits the city’s two universities four times a year to lecture on stormwater management and planning. “Once they understand the topography, they realize these areas will always be prone to flooding,” says Cahoon. The city’s annual nine-week Neighborhood Leadership Academy has been another valuable outreach effort. The workshops provide homeowner associations and community leaders with a thorough understanding of government operations, the appropriate approach to bring change to their neighborhoods, and the best ways to access city programs and services. “Educating citizens about the stormwater program enables them to help us more effectively, and for us to serve the community more efficiently,” Cahoon says. Similarly, Durham (North Carolina) Public Works found the best way to limit stormwater infiltration is with help from private citizens. That ongoing program began with a pilot project called Rain Catchers running from 2012 to 2014. A total of 880 households in the South Ellerbe Creek watershed were contacted, and 156 properties were selected for rain gardens, rain barrels or cisterns, and planting trees chosen for their particular stormwater abatement suitability. Downspouts were also disconnected so that water would be dispersed rather than flowing straight into the stormwater collection system. “Basically what I tell people is, what you want to do with the stormwater in your yard is slow it down, spread it out, and soak it in,” says Laura Webb Smith, public education coordinator. Like most Western cities, Greeley, Colorado, has a comprehensive water conservation plan. In fact, according to John Thornhill, water resources operations manager, the city has been practicing water conservation since 1907, when the community’s early settlers limited watering to certain days of the week and enacted time-of-day restrictions. One big new idea is called the Water Budget, a fluctuating water rate system implemented to reward customers for conserving water. It establishes an optimum water amount based on factors like yard size and number of people, and those who stay within that amount pay a lower rate. An online portal allows users to go online and see their water usage in real time. Thornhill says marketing has helped the program get off to a good start. “We began talking about the Water Budget in our billing statements four years prior to its start,” he says. In addition, he estimates the city made between 40 and 50 presentations on the program. Overall, Greeley has reduced water consumption by more than 20 percent through a variety of conservation measures. The city offers a shower-head exchange, toilet rebates, and rebates for water-smart landscaping and irrigation practices. In general, a proactive approach to stormwater projects is best, and most municipalities find that the only way to achieve success with these projects is getting private-side support. When Evansville (Indiana) Water and Sewer Utility was looking for help to reach their ambitious overflow control goals, it found opportunities for green solutions in public and private spaces in the downtown area. A key to implementing these solutions is getting the private sector to buy in. 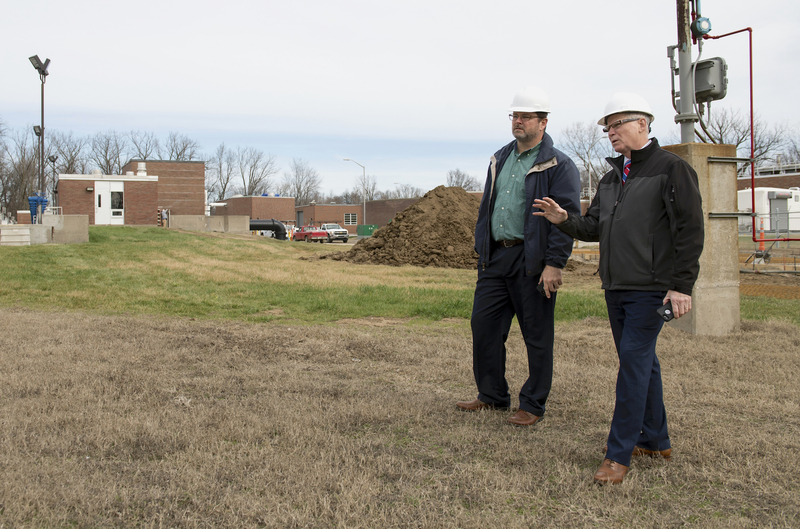 Evansville is using public-private partnerships to accomplish that, through public outreach and incentivizing private sector owners to include green infrastructure in their build-outs. The program is known as the Green Infrastructure Participation Plan, and the utility has placed a higher priority for green infrastructure projects in the downtown area. For approved projects, the utility will pay a one-time 20-cents-per-gallon incentive for every gallon of stormwater redirected away from the combined sewer system. Sometimes, getting the public involved is more than the city can handle on its own, which is why many cities have found success in working with other organizations and developing mutually beneficial relationships. The Miami-Dade Water and Sewer Department founded the Resilient Utility Coalition — a strategic partnership formed between utilities in four South Florida counties and professional organizations to advance utility infrastructure resiliency efforts and help members deal with new challenges, especially the effects of climate change. “The coalition aims to enhance the usefulness of climate science by developing joint adaptation strategies and improving water management decision-making in the face of climate uncertainty,” says Hardeep Anand, deputy director for the utility’s Capital Improvement Program. A big part of the coalition’s plan is to develop “tech talk” educational opportunities and publish community outreach materials, in addition to resources for workers public side. Anne Arundel County (Maryland) Public Works has done a lot of innovative work to meet new permits and runoff limits, but partnerships the county has developed with the private sector and area nonprofit organizations may be the most creative efforts. They offer incentives for entities outside the public realm to participate in restoration work, helping improve the environment of the watershed while adding to the county’s credits toward permit compliance. Using funds from the Chesapeake Bay Trust, private groups can renovate their own property with restoration grants. Submissions to the program are evaluated by the county for alignment with their goals. “We are looking for turnkey restoration projects that we can use toward meeting the county’s overall restoration goals,” program administrator Erik Michelsen says. Participants receive payment once the projects are complete. Throughout the watershed restoration and protection program, the county has overcome a number of challenges inherent in working with the private sector. Communication is key, Michelsen believes. “We’ve done a lot of work on private property — negotiation, purchase of property — a lot of hurdles,” he says. Another key is assigning specific project managers to specific geographic areas so they become familiar with the territory, and then making them accessible to the public.